Mete Gazoz and Yasemin Anagoz were named recurve man and woman of the year. The winners of the World Archery Athlete of the Year awards for 2018 were announced during the 2019 Indoor Archery World Series Finals in Las Vegas on 9 February. For the second time in a row, the winner of the recurve men’s athlete of the year award also received the breakthrough gong. In 2017, that was Steve Wijler; in 2018, it was Mete Gazoz. Turkey also won the recurve women’s award, courtesy Yasemin Anagoz, the para women’s award thanks to Merve Nur Eroglu – while Goktug Ergin was named coach of the year. Sara Lopez won the compound women’s trophy for the fourth year in a row. “It’s incredible because I used to admire people that were in that position. Knowing all the hard work my team is doing is paying off makes me so proud,” she said. Athletes are shortlisted for the awards after being nominated by national archery federations. The winners are decided by a combination of a public poll and expert panels. Nearly 100,000 public votes were cast for the 2018 awards. At 19 years of age, Gazoz won his first Hyundai Archery World Cup stage with gold in Berlin, beating Lee Woo Seok in a one-arrow shoot-off. He had jumped up into the top five in the recurve men’s world ranking by the end of 2018. 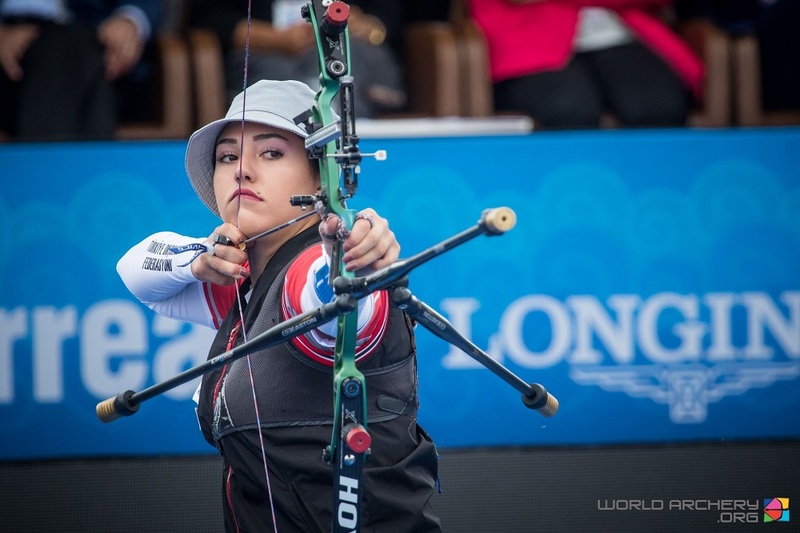 As well as winning the European title in 2018, Anagoz nearly produced the shock of the Hyundai Archery World Cup Final when she surged to the gold medal match – after only being at the event on an invitational ticket – only to lose out to Lee Eun Gyeong. Gold medals at the Hyundai Archery World Cup stages in Antalya and Berlin kept Schloesser in the number one spot in the world rankings at the end of the season. He also became the second compound archer in history to complete the world championship triple, adding the 2018 World Archery Field Champion and World Archery Indoor Champion titles to the outdoor crown he won in 2013. Lopez shot three Hyundai Archery World Cup events in 2018 and won all of them, including the Hyundai Archery World Cup Final in Samsun. She joined Brady Ellison as the only archers in history to have four career wins at the annual season-ending event. The 23-year-old Colombian archer also won the Pan American Championships, South American Games and Central American Games in 2018. As well as winning the Pan American title in 2018, 36-year-old Mather swept the recurve men’s open 1440 Round world records (five in total) at a single event in October. Eroglu won a second consecutive silver medal at the European Para Championships in 2018 and was listed number four in the recurve women’s open world rankings by the end of 2018. Since making his Olympic debut in Rio in 2016, Gazoz has gone from strength to strength – but only in 2018 did he make the jump to the international podium and take a position as one of the best recurve men in the world. The head coach of the Turkish international team, Goktug has developed his squad into a consistent contender boasting young star power in 2018 Athlete of the Year winners Mete Gazoz and Yasemin Anagoz, compound nominee Yesim Bostan and Demir Elmaagacli.